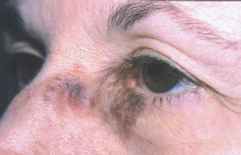 INTRODUCTION Also known as Hutchinson's melanotic freckle or precancerous melanosis, lentigo maligna is a pigmented patch most often found on the sun-exposed forehead or malar areas and may involve the lower eyelid and canthal areas. 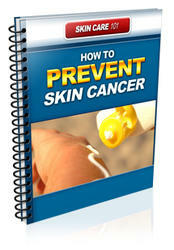 It represents 4% to 5% of all cutaneous melanomas. Lentigo maligna arises from the benign lentigo senilis (solar lentigo), and represents a premalignant in situ stage of what later can become invasive lentigo cutaneous malignant melanoma. After a variable period of slow peripheral growth (up to decades), nodules of invasive melanoma develop in these lesions in 30% to 50% of cases. Lentigo maligna accounts for 90% of head and neck melanomas and has the most favorable prognosis of all tumor types. Once it becomes invasive, however, the prognosis falls significantly. CLINICAL PRESENTATION Lentigo maligna presents as a flat cutaneous macule with irregular borders and variable pigmentation from tan to brown. It typically presents during the fourth or fifth decades of life as a small lesion that slowly enlarges. Patients may also have primary acquired melanosis of the conjunctiva, which may be the mucous membrane equivalent. Lentigo maligna may have a long in situ (horizontal growth) phase in which the pigmentation extends for up to several centimeters in diameter over many years. This phase is associated with variable growth and sometimes with spontaneous regression of the lesion with alteration in pigmentation. Subclinical extension may be apparent as a broader area of pigmentation when the lesion is examined under a Wood's lamp. When areas become invasive lentigo maligna melanoma, nodule formation is seen within the broader flat macule. Lesions on the eyelid may progress over the eyelid margin and onto the conjunctival surface. proliferation of highly atypical melanocytes. Some pathologists consider all lentigo maligna to be melanoma in situ, while others do not. Due to confusion associated with the term "lentigo maligna," Barnhill advocates classifying basal proliferations of atypical melanocytes as either "melanoma in situ" or "lentiginous melanocytic proliferation with atypia" for those lesions judged to fall short of melanoma in situ. DIFFERENTIAL DIAGNOSIS The differential diagnosis includes lentigo senilis, pigmented actinic keratosis, reticulated seborrheic keratosis, malignant melanoma, and cutaneous fungal infections. 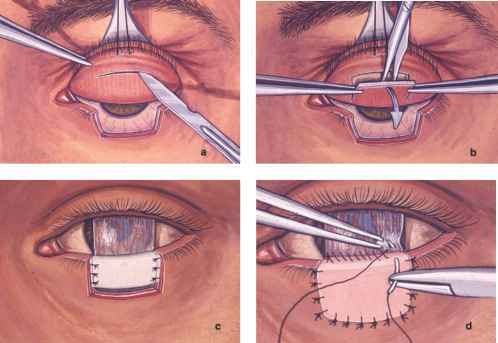 TREATMENT The treatment of choice for lentigo maligna is complete surgical excision. In general 2 to 4 mm of clear tumor-free margins may be sufficient. If there are suspected areas of invasive lentigo malignant melanoma a wider surgical excision with 1 cm of clear skin margins confirmed by histologic monitoring is recommended. Mohs micrographic surgery has been associated with the lowest recurrence rates of 4% to 5%. Alternative treatments with cryosurgery or radiotherapy are also effective with reported recurrence rates of about 8% to 10%. More recently the topical immunostimulator, imiquimod, has been shown to destroy these tumors before they become invasive. Is lentigo maligna squamous cell carcinoma?